A docent is a teacher. The word “docent” comes from the Latin word “docere” which means teacher or educator. Docents provide educational experiences through presentations and exhibit interpretation with live animals and other materials. 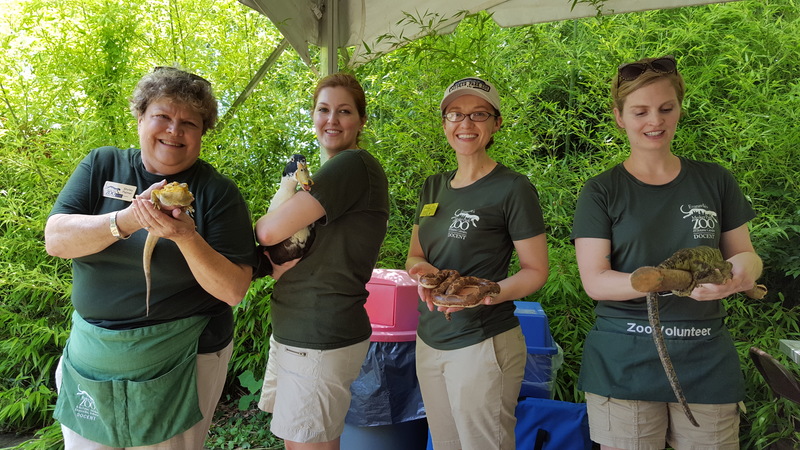 This might include working at special events, conducting outreach programs at schools, roaming Zoo grounds with ambassador animals… and much more! Help the Zoo accomplish it’s mission by reconnecting people with the natural world in a variety of fun and interactive ways. How do you become a Docent? Complete our training program, which includes both classroom sessions and informal training with your docent mentor. Commit to volunteer at least 60 hours each year to remain active. Informational Meeting for Prospective Docents Sunday, August 12 at 2:00pm to be held in Discovery Center Classroom (use Zoo entrance at Bement & St. Joseph Avenue). We look forward to helping you take the first steps to a lifelong adventure with our intensive (and fun!) Docent training program. Are you already a Docent?